A vignette of my new Park Avenue Collection for Henredon that includes the Morgan lounge chair and ottoman, the East River sideboard and the Candela mirror. 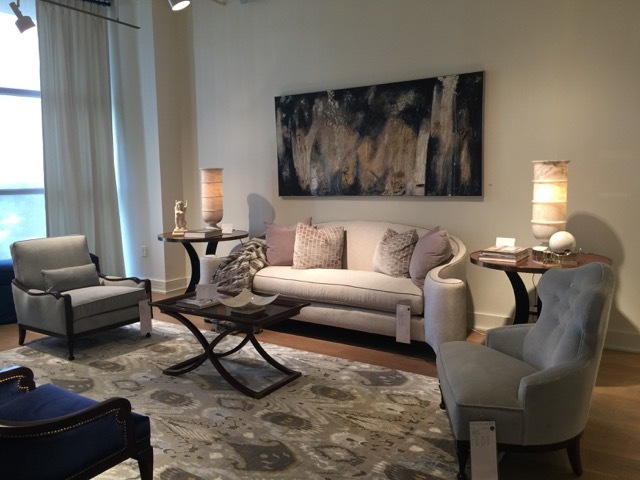 One of the highlights of High Point Market for me was the opportunity to unveil furniture I designed for Henredon in the Park Avenue Collection. Seeing my designs displayed as I had conceived them in a lovely section of the company’s new showroom on the fifth floor of Market Square was truly satisfying for me. I created the suites of furnishings with elegance in mind, a stylishness that would have been di rigueur with the well heeled in New York City in the 1920s. 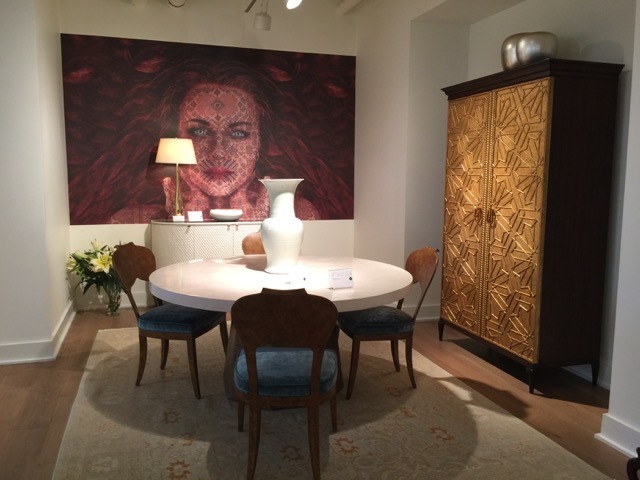 The Rosario tall cabinet is one of my favorite pieces in the collection, the embossed door leafed in Plaza Gold reminiscent of artistic details of the Ottoman Empire. During this time, which ushered in an explosion of wealth in NYC, the famous avenues that slice through the city—notably Park, Madison and Fifth—became home to some of the wealthiest and most influential families in America. The homes built by these affluent world-travelers represents to me, like many other elements of timeless traditions during modern times, a gracious but vanishing past. The storied list of names includes Vanderbilt, Carnegie and Rockefeller, of course; and many others as well. The York Avenue sofa is flanked by the Morgan lounge chair and the Sycamore chair with its button-back and ample seat. Referencing a level of sophistication embraced by these cultured individuals who created the city’s great pre-war neighborhoods, I intended the collection to have a contemporary perspective. There are also references to the Orient and to France because travel between America, Europe, Africa and Asia was incredibly fashionable at the time. 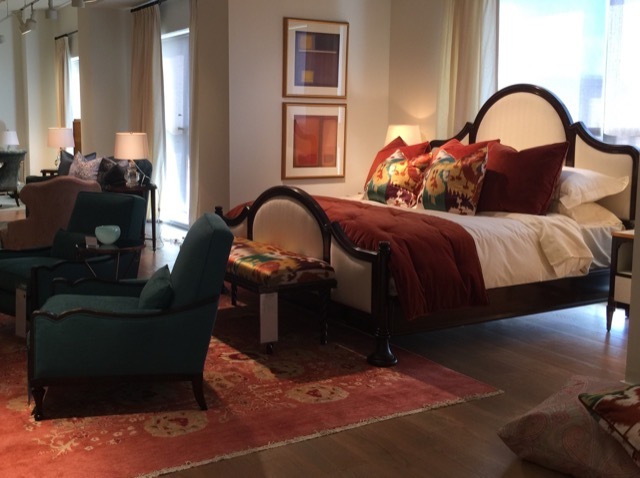 This vignette from the Henredon showroom is anchored by the Queensboro bed in a rich Hudson Walnut finish. You may notice a nod to tulips in the collection, which ties our modern times to earlier periods when the patterns mimicking the unfolding motifs created when tulip petals fan out were ubiquitous in the exotic décor created by sheiks and sultans. The rich colors are emblematic of the flower, as well, and of hues seen in the spice markets that drew these globetrotters to far-off ports of call and in the finest drawing rooms in Paris—colors brought back to their townhouses marching north from the stately Grand Central Station to the burgeoning Upper East Side to remind them of their journeys. 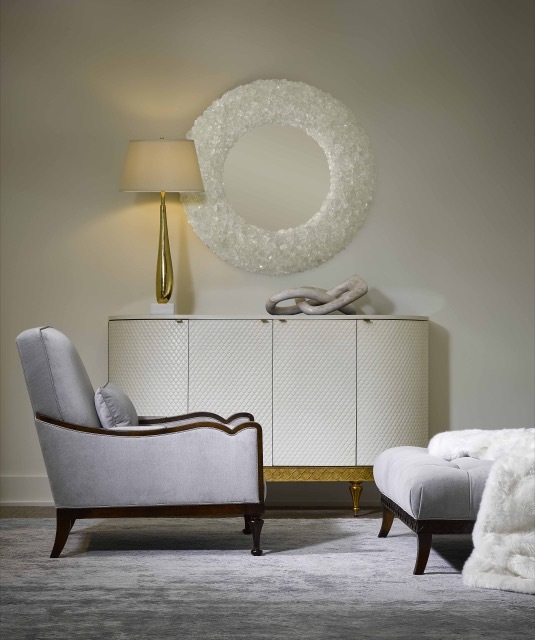 This bedroom vignette featuring the Monroe Tufted bed also includes the Queensboro dresser and the Candela mirror with its rock-crystal frame. Though nostalgia is a potent draw, I made certain the themes echoing back to these times were contemporized to fit perfectly within today’s interior styles, the updated materials bringing all of these influences into the present. These include brass, agate, polished metals, rock crystal, crushed black stone and marble—all working together to form a palette that remains au courant. Fabrics are luxurious and reminiscent of the French salons, chosen to be lasting, which is so fitting for today’s busy homes. The collection is dressed in blue, cinnamon and gold hues, the same tones I had the pleasure of seeing on the runways in Paris this past January, and ones that I knew would remain fresh in color forecasting in both fashion and interior design for quite some time. 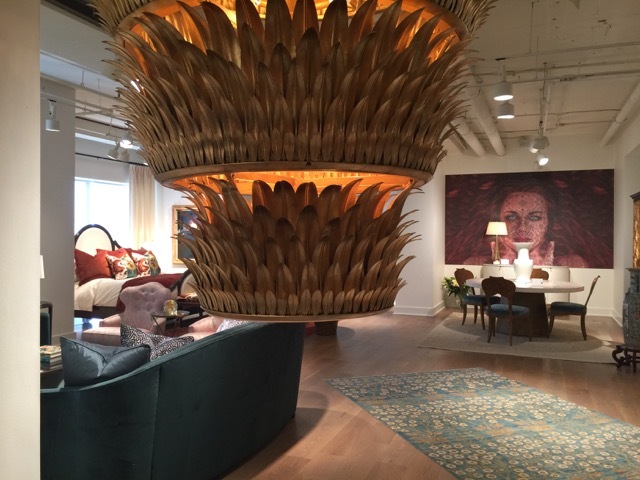 I’d like to thank Currey & Company for allowing me to place their Havana Grande chandelier within the collection, the exotic feel of the work of art so on point to illuminate the designs I produced. Also a main goal of mine was to create a collection that escapes the limitations of masculine or feminine sensibilities. I was determined that it would crossover naturally. 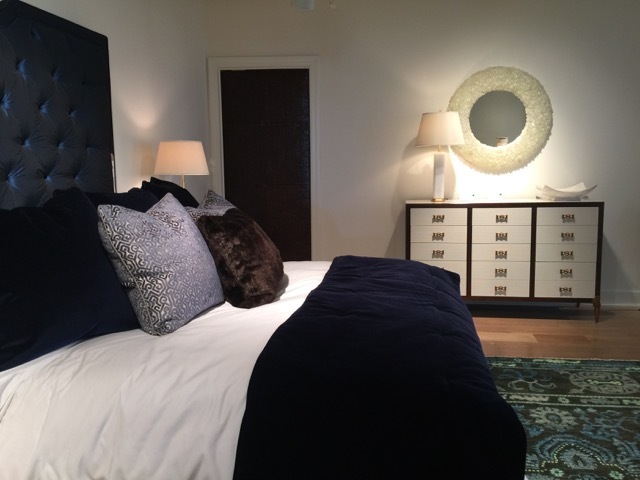 The height and drama of the Monroe Upholstered Bed in navy blue is an example of this stance. One of the occasional chairs is modeled after a chair in Paris, which would be just as comfortable in a feminine living room as it would be in a masculine study. 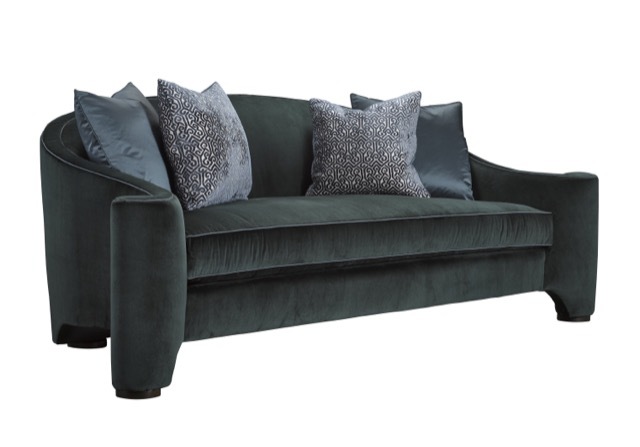 The York Avenue sofa changes its personality significantly when it is upholstered in a rich, dark fabric as opposed to the sumptuous pale fabric above. 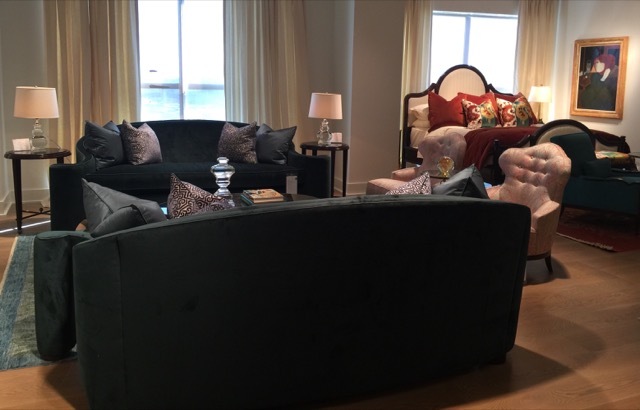 Reyna Moore, Vice President of Merchandising and Brand Director for Henredon says of the Park Avenue Collection, “It’s the spirit with which we all convey ourselves when we’re feeling our best, but comfortably at home in our most private spaces. It’s a statement of pure luxury.” The Park Avenue includes bedroom suites, two dining room configurations, the Manhattan cocktail table, and a variety of upholstery pieces. 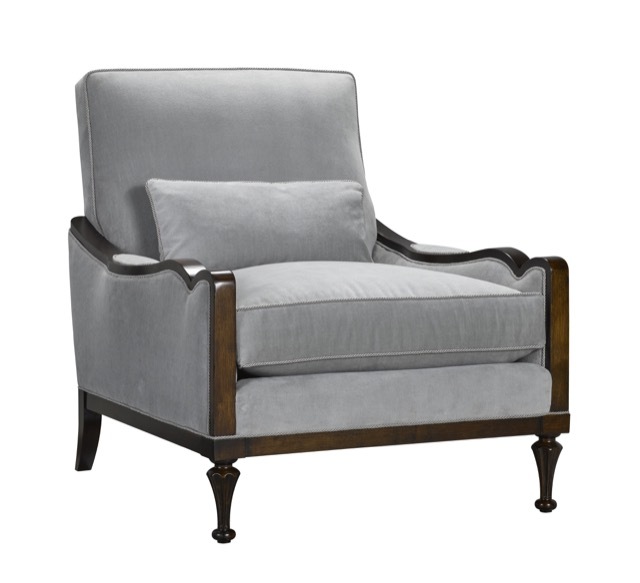 Comfort married with true stylistic sophistication was my aim with the Morgan lounge chair. Regan Iglesia, the chief merchandising officer, says of my designs, “The fine materials, architectural forms, luxe fabrics and couture shapes of the Park Avenue Collection epitomize the Henredon brand. We are thrilled to introduce this beautiful new collection, which has brought a new level of sophistication and style that brand enthusiasts the world over will celebrate.” And I was thrilled to design it! I hope you’ll take the time to explore the collection by clicking through on the links above. One of my objectives with the design of the curvaceous York Avenue sofa was to create a shape that would be just as graceful in the middle of a room as it would against a wall. This journal entry, The Bruce Andrews Park Avenue Collection Debuts, © Bruce Andrews Design, all rights reserved. Our Bruce Andrews Design collections are available through Nandina Home in Aiken, SC; Jalan Jalan in Miami, FL; the Michael-Cleary showrooms in Chicago and Washington, DC; and the ID Collection in Dallas. Our new Curated line is available through Nandina and Jalan Jalan, and Mitchell Hill in Charleston, SC; Dixon Rye in Atlanta; the Redefined Home boutiques in Atlanta; and AREA and Mecox, both in Houston, TX. You can also purchase all of our products directly.